Dating information is provided when available along with designer information where appropriate. Other details such as the size and weight of pieces are also included in the descriptions if known. This sultan brooch is marked only sterling. It is missing the original earrings, but overall condition is excellent. This marked Hobe Sterling brooch has a carved face simulating Bandora wood. All sterling including chain dangle. Condition is excellent. Sterling silver ring marked with logo of George Jensen. Condition is good. Small ring size: 3 1/2. This bracelet is marked Hobe Sterling. It is set with unfoiled blue rhinestones. Condition is excellent. This marked Hobe Sterling bow brooch is set with unfoiled glass rhinestones. Condition is excellent. These handcrafted earrings by Israeli artist Avi Soffer feature Roman glass pieces set in sterling silver. Condition is excellent. This heavy Mexican sterling bracelet has a finely carved obsidian mask and elaborate silver headdress. Mark indicates it was made in Taxco after 1979 by an unidentified artisan. Centerpiece measures 2 1/4" by 2 1/2" long. Condition is excellent. Marked Tiffany sterling silver bracelet in rope pattern. Condition is very good to excellent. Tiffany sterling silver triple strand necklace with hearts. Weight: 4.1 troy ounces. Condition is excellent. Measures 16" long. Signed "Hobe Sterling Design Pat'd." brooch made of heavy silver with dove and dangling bow. Condition is excellent. Measures 3 1/2" long. This jelly belly deer pin is marked only "Sterling." Jelly Belly pins are perennially popular with collectors and often command very high prices. Since this one is on the small side in size and only marked sterling, it is not quite as desirable as pieces made by Trifari and Coro during the 1940s. Signed "Prieto 925", the links in this bracelet feature Halloween or superstitious motifs: broom, clover, witch on broom, horseshoe, old crone, number 13, and a ladder. Measures 1 1/4" wide and 7 1/4" long. Weighs approximately 54 grams. Condition is excellent. This cuff bracelet was designed by Emilia Castillo, current head of the famous Los Castillo silver workshop and daughter of silver masters Don Antonio Castillo & Margot de Taxco. It features intricate tropical foliage and flowers crafted of 950 silver (more pure than 925 silver) weighing 5.5 ounces. Retailed at Neiman Marcus in the 1980s and early '90s. Measures approximately 2" wide. Condition is excellent. This Diamonbar bracelet, made by Wachenheimer Brothers, Inc. of Providence, Rhode Island features two rows of sparkling rhinestones set in sterling. Measures 7" long. Condition is very good to excellent for this type of piece. This heavy lightning bolt design dating to the 1940s. Only marked "Sterling." Measures 2 1/2" across. 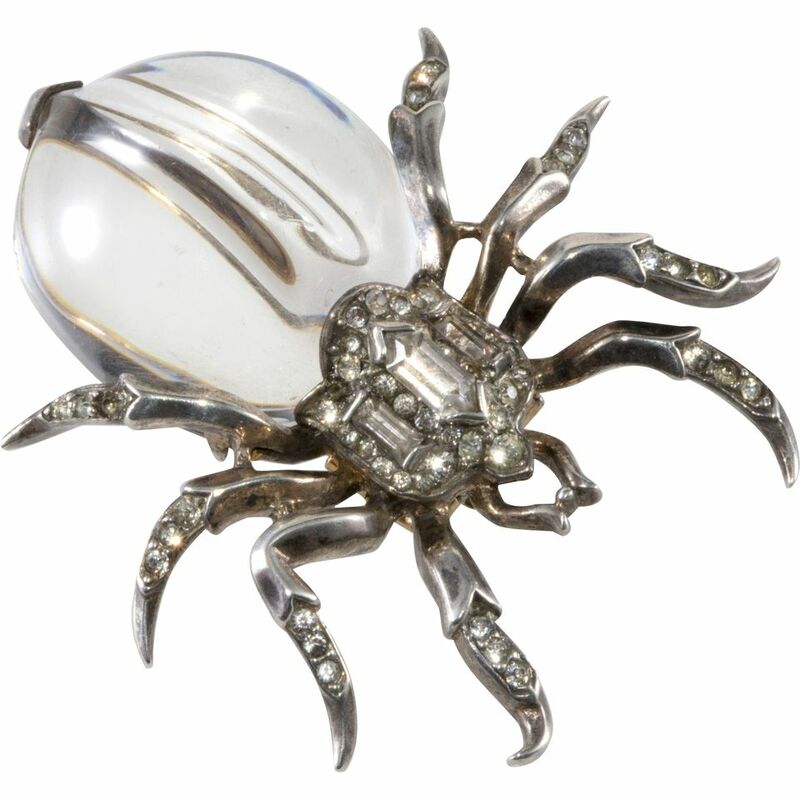 In the 1940s, sterling silver was the metal of choice for costume jewelry manufacture. Most other base metals previously used in jewelry manufacture were being diverted to the war effort. Lot including necklace, bracelet, and pair of earrings all stamped "Margot de Taxco 5488 Mexican Silver". Condition is excellent. Necklace measures 14" long. Heavy bracelet with floral décor and opaque green stones. Signed "Hobe". Condition is excellent. Measures 1 1/4" wide x 8" long. This sterling silver bracelet with enameling is unmarked. Condition is excellent. Measures 2 1/4" in diameter. This brooch from Hobe's Bandora series was made during the 1940s. Condition is excellent. Silver bracelet marked "Sterling Denmark" and "Georg Jensen". Condition is excellent. Measures 7" long. Articulated brooch marked "Hobe Sterling." Made during the 1940s. Condition is excellent. Don't be fooled by false forms of silver. Read: What are Nickel Silver, German Silver, and Alpaca?